The engine is as expected more compact than the previous 5-cylinder it replaces. 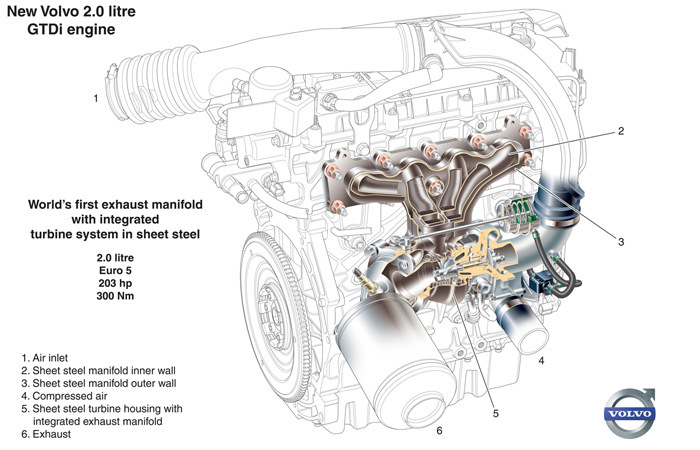 It has direct injection and electro-hydraulic variable valve timing in both camshafts. With the use of direct injection, turbocharging and vvt the engine can optimize the fuel burn and be both efficient and powerful. Of course this is contemporary but not really new, similar engines are offered from VW, Fiat, Mazda and more and more companies will follow. The manifold is made from sheet steel and has two walls. A sheet metal exhaust manifold is used already in many models but in turbocharged vehicles the turbine cowling is a separate die-cast part that bolts on it. Here the turbine is housed inside the manifold. This installation has a lot of advantages and cost aside, doesn't seem to lack anywhere in comparison with conventional turbo installations. The manifold-turbo is more compact and light. In the GTDi engine the turbo is placed behind the engine (between the engine and the firewall) and not in the front as usual thus helping the weight distribution. It is also more heat-efficient, a die-cast manifold absorbs huge amount of heat from the exhaust gases and radiates it in the engine bay. This double wall sheet metal has much smaller heat transfer factor and the exhaust gases can reach the turbine retaining more energy. It can also be formed in order to be more aerodynamic and optimize the gas flow. The system is developed by Volvo, Borg-Warner and Benteler Automotive, a steel component manufacturer. The turbo is a K03, very small size for a 2.0lt engine of that output. The new engine will be available with Volvo's new double clutch 'Powershift' 6-speed gearbox.